Just days after returning to work from five weeks of furlough, NASA employees convened for a town hall meeting with the agency's administrator Jim Bridenstine today (Jan. 29) to discuss the implications of the longest government shutdown in history. 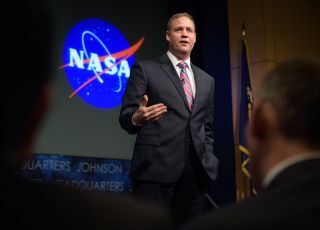 "NASA is now open, and we're very thankful for that," Bridenstine told a room full of NASA employees at the agency's headquarters in Washington, D.C. "I know how trying the last month has been ... it has been tough. I want to say thank you for your patience and for your commitment to this agency," he said. When the partial government shutdown began on Dec. 22, almost 95 percent of NASA employees were furloughed and sent home from work without pay, not knowing when they would be able to return. With only a handful of essential personnel running the agency — many of whom were working without pay — NASA still managed to make it through some historic achievements during that down time. On Dec. 31, NASA's OSIRIS-REx spacecraft entered orbit around the asteroid Bennu, making the distant space rock the smallest object ever orbited by a spacecraft. Bridenstine lauded the orbital-insertion maneuver as "extremely successful." Just a few hours later, NASA's New Horizons mission flew by the Kuiper Belt object MU69 (nicknamed Ultima Thule), which then became the most distant object a spacecraft has ever visited. The flyby "captured the imagination of the entire country and in fact the entire world," Bridenstine said. Although the agency was essentially closed for business, NASA was able to communicate important details about these missions to the public (and to its absent employees) because, thankfully, the people in charge of those communication systems were prepaid contractors, Bridenstine said. The NASA administrator said he personally made sure that those live events and webcasts would continue despite the shutdown. "Flying by Ultima Thule isn't a once in a lifetime opportunity, but a once in humanity opportunity," he said. "Let them do their job." Contractors that were still legally allowed to work for NASA during the government shutdown may or may not end up receiving pay, Bridenstine said. Because not all contracts are equal and can have different types of provisions, NASA has to handle each contract on a case-by-case basis, NASA's deputy associate administrator Melanie Saunders said during the town hall, adding that "getting civil servants paid is a very high priority." Now that the government is open for business again — at least for now — NASA employees are back at their desks, labs and test facilities, working to make 2019 a successful year, despite being off to a rough start. At the end of today's town hall meeting, Bridenstine presented an epic new video showing all the exciting missions NASA is working toward this year, like the maiden flight of its new Space Launch System megarocket and the first test flights of the Crew Dragon. NASA scientists can look forward to the first data and images from the recently launched Parker Solar Probe as well as the InSight Mars lander. Meanwhile, engineers are developing some groundbreaking technology, like quieter supersonic planes; a new space-based GPS navigation system that uses pulsars; and the infrastructure needed to stream live HD videos from the moon to people on Earth. "NASA is essential and critical, not just for those of us who work here, but for people across the country and the globe," Bridenstine said, adding that the work NASA does "affects everybody's lives." If Congress does not agree on a new spending bill before the temporary government-funding continuing resolution expires on Feb. 15, NASA will have to put almost all of its work on hold again, along with roughly 800,000 furloughed federal employees nationwide.